It is time once again to mark the Pedagogical Days on our calendars: 17 and 18 March. Alongside good examples, inspiration and collaboration, this time the organisers also want the focus to be on quality. 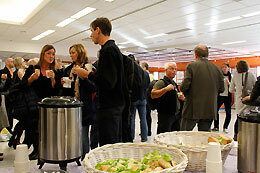 Around 140 people signed up to the first Pedagogical Days, at the end of October 2013. (Picture below.) The days received a good response in the feedback evaluations, especially the format – lectures combined with optional activity “stations”. So why abandon a winning formula? “Following the vice-chancellor’s introduction, we will have three talks interspersed with eight different stations, from which the participants can choose two,” explains Margareta Bachrach-Lindström, head of Didacticum which are organising the event this year. The Pedagogical Days started in 2013 as a part of the Pedagogical Leap, the vice-chancellor’s initiative to put focus on the quality of education. Didacticum, which is also a strand within the Pedagogical Leap, has been charged with organising the days. The Swedish Higher Education Authority’s quality evaluations, one of the days being with University Chancellor Harriet Wallberg. Judging pedagogical skill. Experiences from Umeå University where they have been working on projects such as a merit model. Quality from the students’ perspective. Representatives from all the Student Unions. “The complete programme and application forms will be posted on the Didacticum website soon. So keep an eye out, but mark the days in your calendar now,” says Ms Bachrach-Lindström.